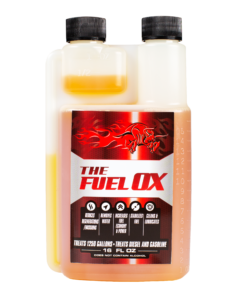 Fuel Ox is a multifunctional and comprehensive fuel treatment that enhances fuel combustion and engine performance. Fuel Ox contains a patented catalyst that lowers the ignition point of fuel – causing an earlier, more sustained combustion. One gallon of fuel additive is designed to treat 10,000 gallons of fuel.